A spinning object will maintain both the magnitude and direction of its spin angular momentum unless some external torque acts to change that angular momentum. In the presence of external torque, the spinning object will precess . Observations indicate that the Earth's spin axis is precessing with a period of about 26,000 years. The spin axis currently points close to Polaris, but in 13,000 years it will be pointed about 47 degrees away from Polaris since the tilt of the spin axis with respect to its orbital plane is about 23.5 degrees. 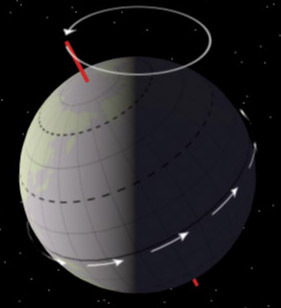 The torque which causes the Earth to precess comes from the gravitational pulls of the Sun and the Moon which try to pull the Earth's rotation axis toward the perpendicular to its orbital plane (the ecliptic plane). If the Earth were a perfect uniform sphere, there would be no precessional torque. The equatorial bulge of less than 1% plus any departures from spherical symmetry in density distribution are the only things which give the Sun and Moon any "handle" with which to exert torque on the Earth.